I finished this guy the other day in between other projects. He's part of the Flesh Tearer squad I've been working on over the past couple weeks. I've talked about him before when I went over building the psychic hood for the model. Even though he's a tabletop job, I added a few extra details in there to make him pop a bit more. I had some trouble painting the blue on this guy because it's not done the same way as the GW formula for Flesh Tearer red is done. My highlights are not toned back down on this guy like they are for the rest of the squad. I needed to make sure that my final highlight on this guy matched the overall darkness of the rest of the squad. As soon as I finished putting the how-to pic together... I remembered covering this before on another model recently. The only difference was that it was on a light background instead of a black one like it is here. 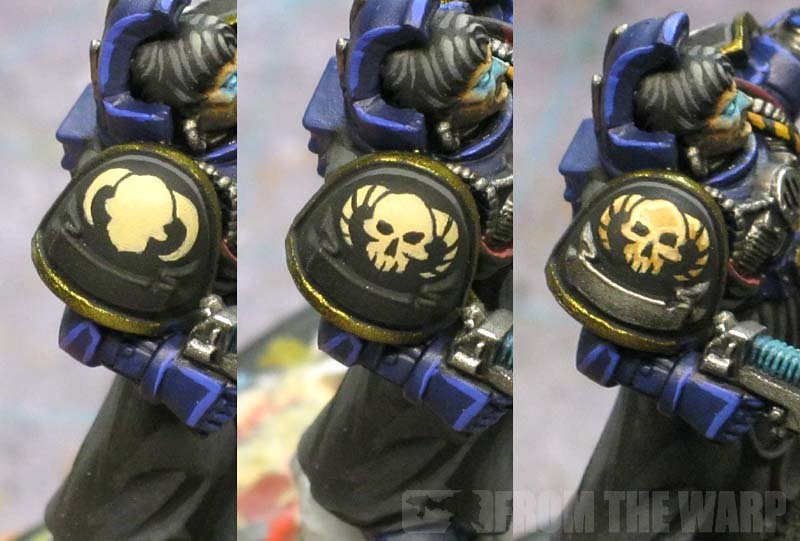 I realize though that all I mentioned in the previous tutorial was that you just "block out the skull shape." That doesn't help the folks who don't know how to do that. So let's look at how I just "block it out." I start by breaking it down into a few simple shapes and overlapping them to get the final complex shape. The first thing is a circle. That is the majority of the skull. From there, it's two tear drop shapes, one at each side along the base of the previous circle. Then it's a straight line down to where you want the bottom of the jaw to be. From there you fill out each side below the tear drop shapes. Doing this will get you a fairly "normal" sized skull each time and you won't have to worry about running out of space. The horns start out as a line across the top of the horn and I fill out the lower portion until it's the shape I want it to be. With the blocked out shape in place, it's easy to go back into it and add a nose, two eyes and a couple lines to show where the teeth should be. That and I add some lines across the horns for added texture. All that done, it's a pass or two with GW Gryphonne Sepia to tone it down some and then go back in with the original color as a highlight to give it some added dimension. I added the glowing eyes effect to the eyes on this model just like I did for a previous one. I like the look myself and think it really makes the Librarian stand out from the other models. I'm not sure how it would look on a whole squad of guys as I think it may lose some of its uniqueness. This model has since been revamped to give him a new look. You can see the new model here. 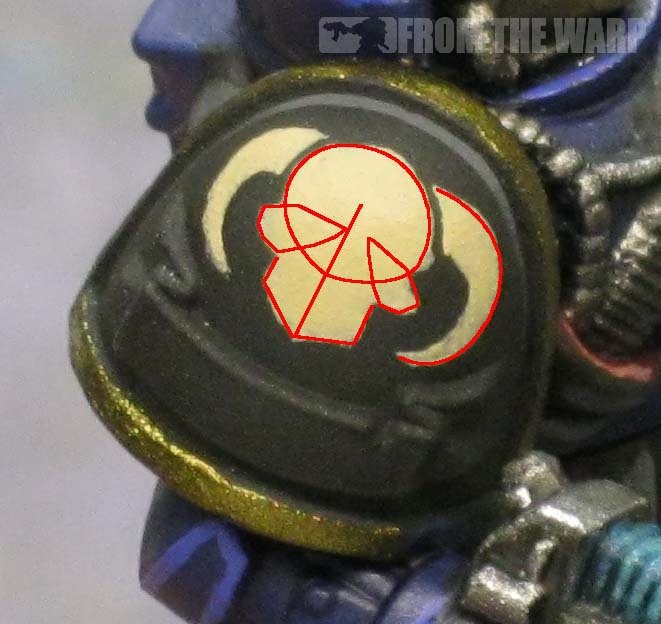 Did I model/paint my HQ wrong? Excellent work as always Ron! The subtle conversions all add up to be more than the sum of their parts. 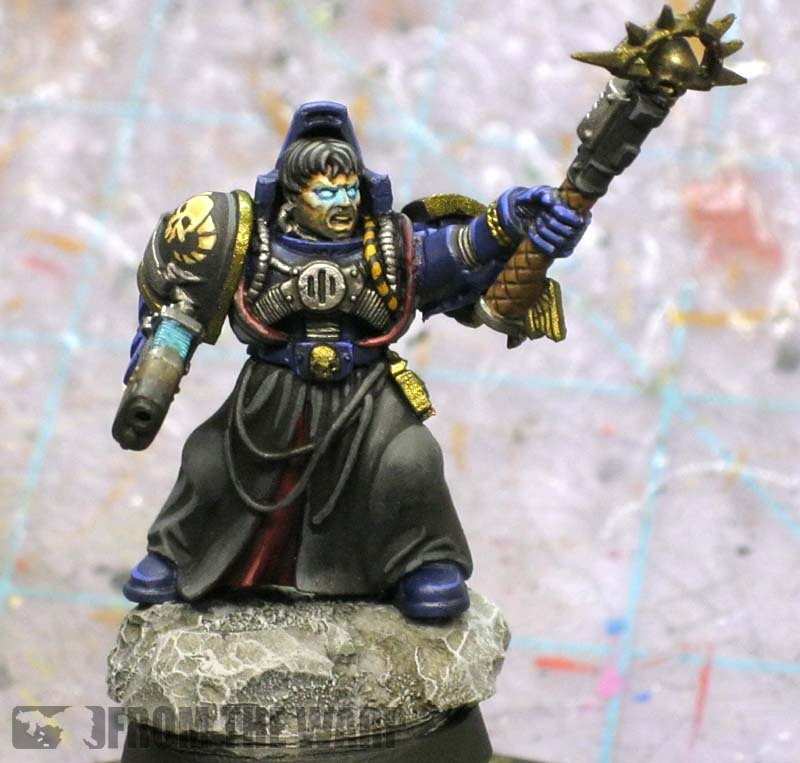 I'm just getting ready to jump into painting a mess of Heresy-era Thousand Sons, so I'm sure your glowing eyes effect is going to be heavily used, what with nearly every character (and squad sergeant) being psykers! Fantastic!!!!!! that's to much talent for one guy, pass some over to us mortals! I like it but I don't think it's as good as some of your other conversions. The close combat weapon he's holding looks more like a Chaplain's Crozius than a Librarian's staff. Wow! That's amazingly simple for an awesome result! That looks sweet- conversion and paintjob both! Which color did you use for your gold? You can expect to see the banner bearer in the coming days as I get the last of him painted up this weekend. Mordian 7th: If I had any nerves, I'd try to paint a Thousand Sons marine with the glowing effect all over his body as though his armour was encapsulating a glowing figure and the light was escaping from certain joints and gaps in the amrour That sounds so cool. Dugatron: Thanks for the honesty. It's hard sometimes trying to balance what the owner is looking for with my own style of modeling. I can't just go and do what I want all the time. That's been a huge thing for me to learn over time. It's not my model I'm bringing to life. it's someone else's and I'm here to make sure they get what they want. Sometimes things are added or left off for reasons beyond my control/understanding/etc. All that being said, it's my job to do the best I can with what I am given so the end model matches as closely as possible what the owner wants to have for their army. My role is to bring it to life, not determine what lives and what doesn't it. Maxime: The gold is P3 Blighted Gold as the base, then a wash of Devlan Mud in the recessed areas, a light drybrush of silver on the upper portions followed by a thin wash of Gryphonne Sepia to tie it all together. Really like it when you show us how you approach those freehand symbols, the layered / step-by-step approach is extremely helpful. Not to mention that this is another ace mini with a very sinister and powerful feel to him due to all the details and overall dark colourscheme. Hephesto: Thanks. I'm working on the squad banner bearer that I'll be doing as a step by step as well since it's such a huge departure from my regular approach.